Possibly the most fascinating planetary theory I’ve read in months! Researchers in Illinois have proposed that the planet Mercury’s bizarre magnetic field might be explained by crystals of iron “snowing” down in the planet’s core. What a lovely idea! Of course, it’s not like any kind of snow we’d recognise. Cubic crystals of hot delta-iron drifting down from clouds of metal, through a molten sea of iron sulfide. Quite an interesting thought, that Mercury’s weather could all be happening inside the planet. Atmospheres are so passé. 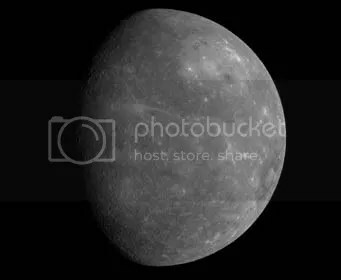 This is all just a theory for now, but Mercury continues to be an interesting little place. I’m looking forward to seeing what the Messenger probe discovers on it’s next pass. 2 Responses to Metallic snow!